Home > Nutrition & Health > Fun Facts: How Many Calories Does Exercise Use? The number of calories burned during exercise does depend on the amount of lean muscle – people with more muscle and less fat will burn more calories. It also depends on the size of the person – a heavier person will burn more calories during exercise than a light person. To lose a pound of fat from exercise alone means burning about 3,500 extra calories. 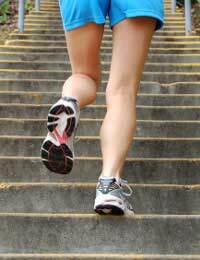 Walking up and down the stairs burns up around 350 to 800 calories an hour. Different kinds of housework burn up different numbers of calories – vacuuming and mopping floors each burn up about 200 calories an hour (scrubbing the floor could burn off 300-500 calories an hour), and cleaning windows burns up about 180 calories an hour. Doing the housework is a great way to get into somebody’s good books too. Helping with the garden could burn off up to 350 calories an hour, but a bit of gentle weeding won’t burn as many as digging over the vegetable patch. The number of calories burned by cycling depends on how rough the ground is, what direction the wind is blowing, and how hilly it is. Gentle cycling will burn up about 300 - 600 calories an hour – but more strenuous cycling could burn off up to 1300 calories an hour. Aerobics can be low-impact or high-impact, and can burn off up to 420 calories an hour for a fast and intense class (step aerobics could burn off as many as 450 calories an hour). Walking as exercise doesn’t need to be ‘going for a walk’ (though that can be fun) – just get off the bus one stop earlier and walk the rest of the way. Walking can burn off anything from about 150 calories an hour up to as many as 420 calories an hour, depending on whether it is on flat ground or up steep hills, and how fast the pace is. Depending on the speed, weather conditions, and hilliness, running can burn off anything up to 1700 calories an hour (but it could just be 450 calories an hour). Swimming can be gentle, but more demanding swimming can also burn off 500 to 900 calories an hour. Football burns up about 470 to 640 calories an hour, depending on the size of person playing. A game of tennis could burn off 350 to 700 calories an hour. Rock climbing involves a lot of strength and stamina, and can burn around 700 calories an hour. Salsa dancing could burn off about 400 calories an hour, and ballroom dancing (depending on how sedate it is) could lose 250 to 400 calories an hour. Ballet probably burns about 330 calories an hour. Just having an extra pound of lean muscle burns an extra 35 to 50 calories a day (without doing anything). Even eating burns calories. Digesting food burns about 10% of the calories eaten.